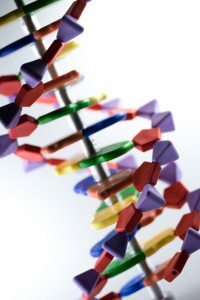 All humans have certain genetic variations or “mutations” that can influence our health. One of the more well-studied variations is known as an MTHFR mutation; more specifically MTHFR C677T and A1298C. 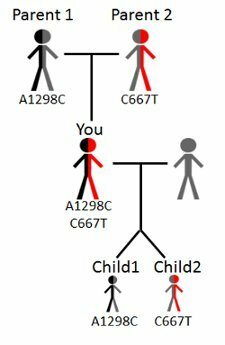 Unfortunately, not only is the concept of genetics difficult, but the terminology makes it even more confusing. 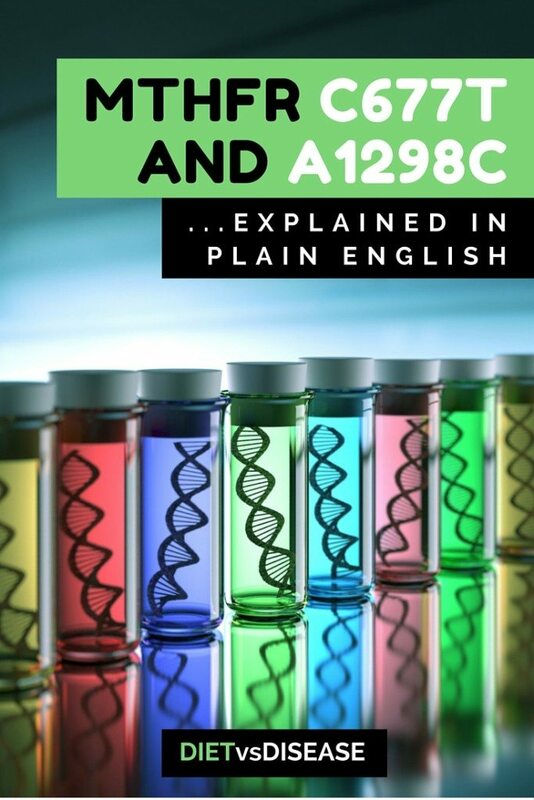 This article attempts to clarify what an MTHFR C677T and A1298C mutation is, in a way you can understand. 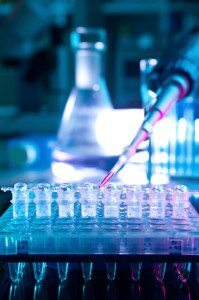 What is MTHFR C677T and MTHFR A1298C? What Is Heterozygous and Homozygous MTHFR? 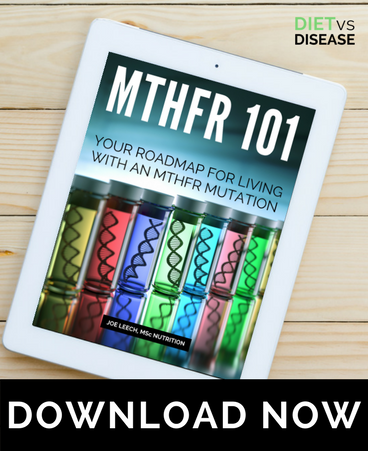 Which MTHFR Mutation Is A Problem? Prefer To Watch The Video Instead? MTHFR is a critical enzyme in the body. It’s required for a metabolic process that repairs DNA, switches genes on and off, and numerous other important functions (1). MTHFR is also essential to convert folate and folic acid – each a form of Vitamin B9 – into the biologically active form called L-methylfolate (or 5-MTHF). Not to be confused with the enzyme, the MTHFR gene provides the instructions for making that MTHFR enzyme. In other words, it “triggers” production of the enzyme. A mutation in the MTHFR gene may therefore affect enzyme function. Summary: MTHFR is an enzyme with many important functions. The MTHFR gene triggers production of the enzyme. A mutation in the MTHFR gene (also known as a polymorphism, defect or variation) can be passed down from your parents. MTHFR mutations are actually quite common, and researchers suspect there are at least 30 different types (2). C677T and A1298C are the most well-studied and tested MTHFR mutations. This number and letter sequence refers to what is known as a single nucleotide polymorphism or SNP (pronounced “snip”). The numbers represent the base position, while the letters represent the allele. While a “normal” MTHFR gene would be C677C (c = cytosine), a mutation/polymorphism has made the gene C677T (t = thymine). Carriers of this T allele produce MTHFR enzymes that are less efficient, hence issues associated with an MTHFR mutation (1, 3). Annoyingly, the gene can also be written with all letters placed after the numbers. So C677T and A1298C can also be written as 677CT and 1298AC, respectively. Summary: C677T and A1298C are the most well-studied types of MTHFR mutation. They are known as SNPs, with the letters and numbers describing where they are and what they look like. MTHFR mutations are typically referred to as heterozygous or homozygous. The prefix “hetero” means different. The prefix “homo” means same. Zygous just refers to degree of similarity. In genetics, hetero- and homo- refers to the two alleles on the gene. For example, for C677T the alleles are C and T, which are different and therefore heterozygous. 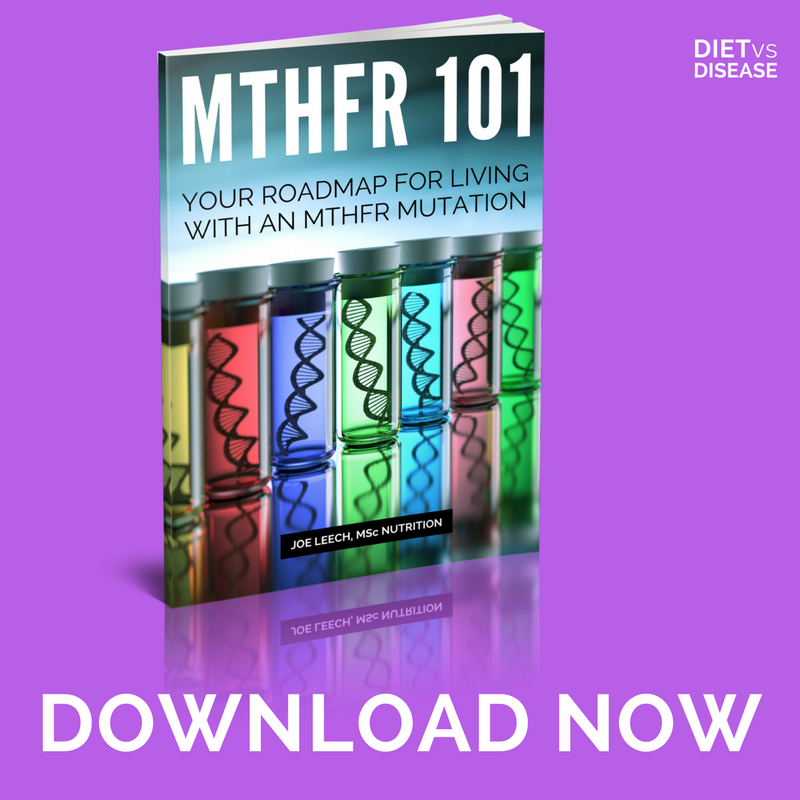 Heterozygous MTFHR means you have one copy of the mutant allele on the MTHFR gene. Homozygous MTHFR mean you have two copies of the same mutant allele, which is considered more severe. It looks like this T677T, although it is typically just referred to as homozygous C677T. So homozygous C677T actually means T677T. There is also compound heterozygous, which is when you have one mutant allele on both the 677 and 1298 base position. This brief list helps to make more sense of the entire concept. One of the biggest concerns for those with an MTHFR mutation is the effect it may have on homocysteine levels in the blood. Homocysteine is an amino acid linked to a wide range of health problems, and is an independent risk factor for heart disease, stroke and other forms of cardiovascular disease (4, 5, 6). It is naturally formed in the body, but gets broken down (recycled) by L-methyfolate (active folate). Said another way, a lack of L-methylfolate can lead to an increase in homocysteine. Although diet and lifestyle are major influences, your genetics are thought to be responsible for between 45-60% of the variance in plasma (blood) homocysteine levels in normal adults (7, 8). Of that genetic variance, C677T mutations are thought to account for between 24-53% of all cases (7). Research shows that regardless of how much folate you consume, homozygous C677T (T677T) subjects always have significantly lower folate levels than heterozygous C677T. Subsequently, they also have remarkably higher homocysteine concentrations than everyone else; most pronounced when folate intake is low (9). 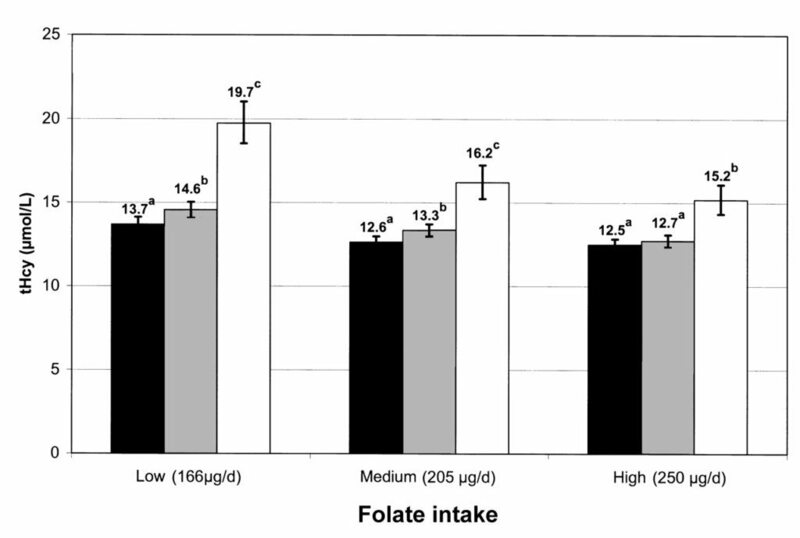 Total plasma homocysteine (tHcy) concentrations according to daily folate intake. Black = C677C; Grey = C677T; White = T677T. Other research confirms that both homozygous C677T (T677T) and compound heterozygous (C677T + A1298C) are linked with higher homocysteine concentrations and greater risk of heart disease (10). 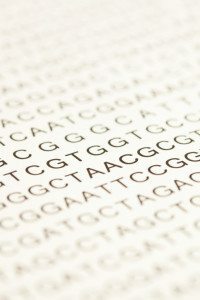 It was concluded that a heterozygous A1298C mutation on its own does not influence heart disease risk. Summary: High homocysteine is an independent risk factor for numerous diseases. Those with a homozygous or compound heterozygous MTHFR mutations are more likely to have elevated homocysteine and greater risk of heart disease. Heterozygous MTHFR mutations seem to have only minor influences on enzyme activity and health. Heterozygous A1298C is thought to be of minor consequence (if any), while heterozygous C677T may affect folate metabolism by up to 35% (3, 11). Compound heterozgous is considered the most severe or “at risk”, but it is thought that homozygous mutations can inhibit MTHFR enyzme function by up to a whopping 70% (11). Always consult with a Dietitian or health professional who can give context to your results and specific situation. For further information I recommend this roadmap guide I’ve put together.